Catch Your Simulated Fishing Limit! 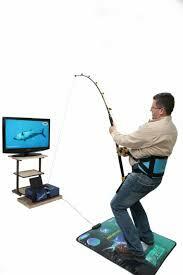 Sport Fishing Simulator is a electronic fishing simulator game that would even challenge Jonah. 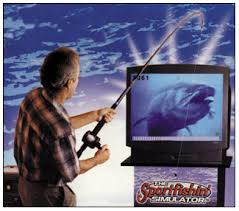 The Sport Fishing Simulator gives the participants the experience of fighting a 110 pound sailfish, 40 pound salmon or an 8 pound small mouth bass. Three world class fish landed again and again through virtual technology. The simulator replicates the strike and fight in realistic heart pumping action. It combines rare underwater footage of three popular game fish with an advanced computer system to create a sensational, totally realistic fishing experience. A new breakthrough in interactive technology! This system consists of a 31" color or optional large screen projection television, a stereo VCR, a central processing unit and an appropriate rod and reel. Equipment requires 1 20 amp - 110v power outlet. One staffer will be provided one hour prior to start of event to assist with operation of the equipment. Two standard tables are needed. equipment requires, if used outdoors, one 10' x 10' fully enclosed tent is required. Contact us today!